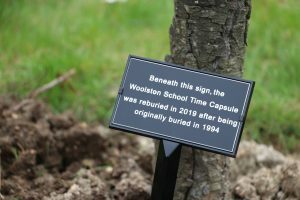 Last week, we were delighted to rebury a time capsule that was found during the demolishment of Woolston School in 2017. Joining us for this special moment was Tom Moody and Tom Wallis from the Hampshire Homes Group, Councillor Warwick Payne and former pupils who once attended the school. The time capsule, dating back over 24 years and originally buried in 1994, was discovered by the Hampshire Homes Group during work to build our award-winning Ashton Walk, a development of 15 three and four-bed homes and 35 one and two-bed apartments. Audley Fraser was Head Boy during the original burial. He came along to help us rebury the time capsule on the site where the school once stood and was pleasantly surprised to find it contained one of his drawings. He said, “This is a fantastic moment and I am proud to be here to celebrate our history.” Also in attendance were former pupils, Katie Thompson and Marie Young.